These are the genuine <?xml:namespace prefix = st1 />U.S. military issue Sun/Wind/Dust Goggles. Their design allows them to be worn right over eyeglasses. Features include black molded rubber frames, foam rubber lining, olive drab adjustable head strap and non-reflective black hardware. 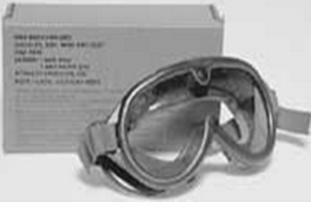 They come complete with interchangeable clear and neutral gray shatterproof plastic lenses. Made in U.S.A. (Extra replacement lenses in the clear color are also available separately.) Individually boxed. Regularly priced at USD$39 ($4 for replacement lens).